Good morning, friends! Hopefully you all have enjoyed the spring-like temperatures. Unfortunately, our next weather system has arrived, and now soaking weather targets our region. Check out the details below on what to expect, possible impacts, and a look into our weekend. 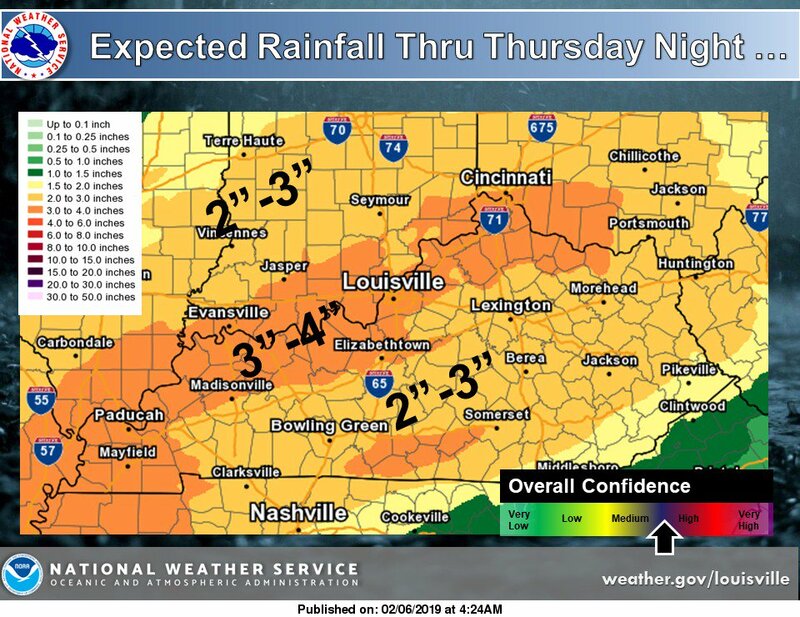 NWS Louisville has issued a Flood Watch for our entire area, starting tonight, and ending Thursday evening. Flood Watch for our entire area. A low pressure system is cutting across the Ohio Valley, and will bring widespread showers to our area. We’ve already had some isolated showers overnight, but our next wave of showers looks to arrive mid morning. Some heavier rain showers will pass over during the afternoon to evening hours (3-9 PM). NAM model indicates rain lasting all day for our area (Pivotal Weather). How much rain will we see today: Moderate to heavy rainfall is expected to produce 1 to 2 inches of rain with locally higher amounts possible. Below shows the GFS model 24-hour rainfall total guidance from midnight last night to midnight tonight indicating 2 inches of rain for today. Possible Impacts: Minor flooding is likely, including the possibility of significant ponding of water on roadways. Expect water issues in low-lying and poor drainage areas. Some smaller creeks and streams will likely see quick rises. Long duration river flooding is expected to continue into next week. Other things to expect: High temperatures may break records today, possibly hitting the low 70s, which will help create some instability. If enough instability becomes present, some isolated thunderstorms may develop in the afternoon and evening hours. Additionally, winds will be out of the south at 10-15 mph, with gusts up to 25 mph possible. Low temperatures tonight will only drop into the low 60s. 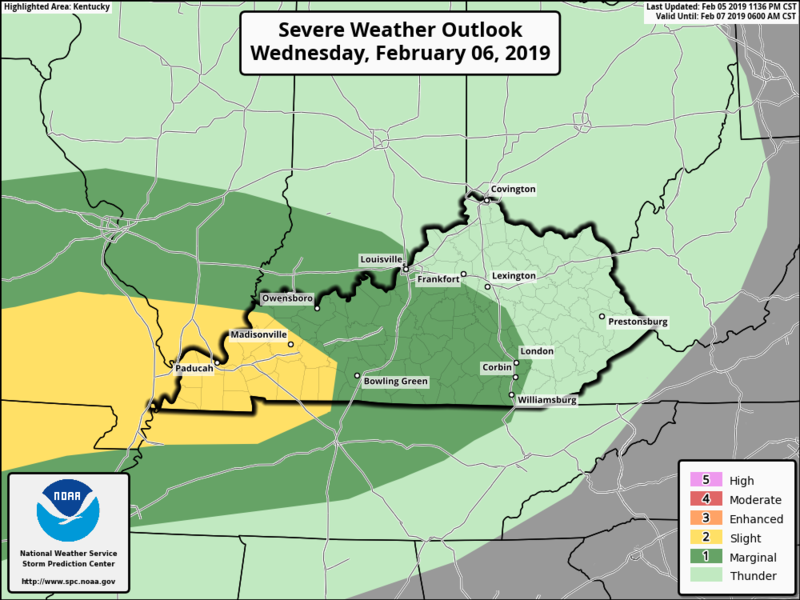 Because of the potential for a few strong or severe thunderstorms, the Storm Prediction Center has issued a Slight Risk (level 2/5) for a portion of our area, and a Marginal Risk (level 1/5) for the rest of our area. After a soaking day today, more waves of heavy rain showers look to push through our region tomorrow. More rain showers look to cover our area tomorrow morning, but NAM 3km (below) indicates a break at lunchtime before heavier rain moves in around 3 PM. Temperatures in the afternoon could hit the mid 70s due to strong southerly winds. A line of strong thunderstorms may develop around 6 PM tomorrow night, with the main threat being high winds. Rain looks to finally move out of our region by late Thursday night into early Friday morning (11 PM – 2 AM). Looking at total rainfall for today and tomorrow, we may see 2 to 4 inches of total rainfall across our entire wxornotBG area. Finally, there is light at the end of the tunnel. The cold front is finally expected to pass though early Friday morning, which will bring clear skies on Friday. Strong winds out of the northeast will be transporting in cold dry air. Temperatures will plummet some 40-50 degrees by overnight Thursday night/Friday morning behind the cold front. Expect cold, breezy, dry conditions with temperatures only getting into the mid 30s during the afternoon and in the teens overnight. High pressure will be building across the region, which will keep things dry through Saturday night. 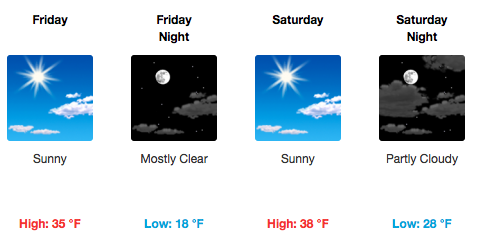 Saturday’s high temperatures should be a little “warmer” than Friday, topping out in the upper 30s in the afternoon, and in the upper 20s overnight. As of right now, light rain looks to enter our region around 6 PM on Sunday. Timing and amounts will change as we get closer to Sunday. 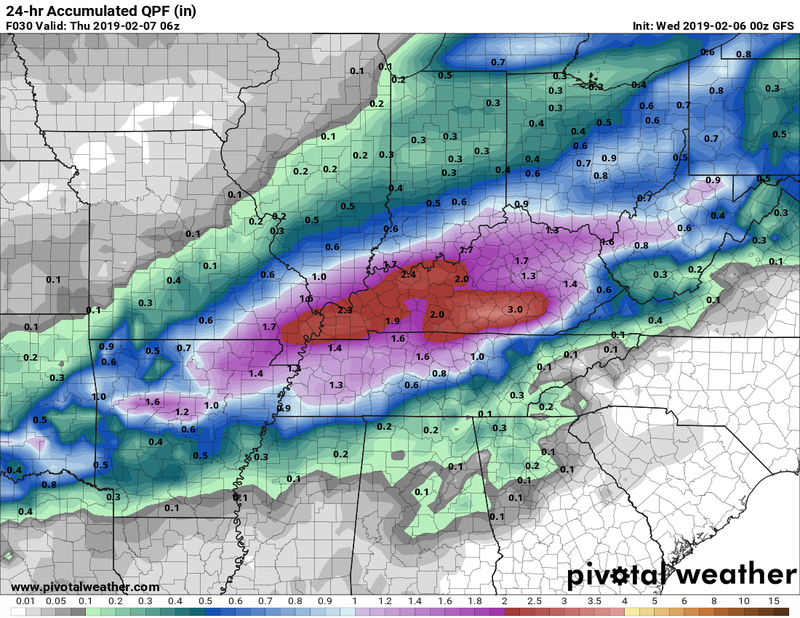 GFS indicates rain on Sunday (Pivotal Weather).